16 januari: E-mailmarketing en psychologie: hoe zet je lezers aan tot actie? You can also book us for an in-house training course that is completely tailored to your own needs and wishes. Need help optimizing your email marketing results? Get in touch! An email marketing campaign for the Christmas period is on every marketer’s to-do list, I’m sure. However, there are always numerous questions that arise in one’s mind. What should I send and when? Should I offer something and how do I best engage? Let me guide you with 3x3 tips for your perfect Christmas email marketing campaign! When is the right timing? When is the right time to prepare a Christmas email marketing campaign? Right now! The “Last minute” strategy is good for traveling, but for your email marketing carry out your best holiday strategy at the beginning of December! Now is the best time for the last two groups, especially if you are planning a Christmas sales campaign and aim for the year’s biggest engagement! But before planning any campaign, know exactly what you want it to do for your business. This will also help you decide about the best timing. If it’s some kind of offer, send it at least a week before the Christmas holidays, so recipients have enough time to take action. If it’s Christmas greetings, send an e-card a few days before Christmas. Although lots of marketers schedule the campaign for the very day of Christmas, you risk being ignored as during the holidays people usually try to get away from work, including their emails. What is the right strategy? A week before the holidays, send the main campaign including the surprise offer, so people have a chance to use it up to Christmas. But why not also send your beloved subscribers a non-selling e-card shortly before Christmas Day? Instead of ending your Christmas marketing activities on December 25, continue engagement with lifecycle email marketing campaigns. A week after the holidays, remind those who haven’t used your offer of it, and ask for feedback from those who have. Christmas email campaigns can give you much more than just additional income. What is Christmas without presents?! Although Christmas is considered the most profitable time of the year for many businesses, it’s also the time of giving... Have you ever wanted to be a real Santa Claus? Whatever it is – a sales campaign or a simple e-card – give your customers something for free. Email marketing is a great tool to reach your audience during the holidays. With awesome email designs, personalized email content and compelling offers, you will definitely catch the attention of your customers. While at the same time don’t forget about the sense of sincerity and generosity that may happen only at Christmas... Use these tips to do both: increase the engagement with your subscribers and remind them of how important they are to you. May the magic of Christmas fill your marketing! In Part 1 we introduced using Personas for Email marketing based upon motivation, in Part 2 I’m going to review the 4 main different personality traits that are common to everyone and show how to apply them to email creative. Aristotle was one of the first to identify them and named them: Melancholic, Phlegmatic, Choleric and Sanguine, however we will be using more descriptive names for these personalities in this post. By leveraging both personas and personalities, you not only know where to place content, images and set tasks but also know how to speak to them (TOV), what offers to deliver and help them to accomplish their task the way they feel comfortable doing so – thus enabling higher and potentially quicker, conversions. Take our Quick Survey & have a chance to win an iPad mini! 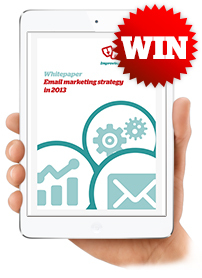 Have you ever wondered if larger marketing teams have a more advanced email strategy? Or if high volume senders are using less personalisation? We want to answer these questions! That's why Pure360 and Plan to Engage have teamed up to bring you a ground breaking report on the current state of email marketing strategy. We would love to have your input in our research - to help us simply fill in our 5-minute survey on your email marketing strategy. As a thank you, you will have a chance to win an iPad mini. All answers will be strictly confidential.